In the past 5 years I guess I played the PC Vanilla, DLC's and PK numerous times - and have only recently started the Soviet Corps Campaign. What I thought strange sometimes, was the fact that German defensive scenarios (beating off Russian attacks) in fact gave victory when gaining ground instead of just being able to withstand the Russians. Thus turning it into, what I felt was, an offensive scenario. Though the Germans were capable of mounting furious counter-attacks or even major attacks (Battle of the Bulge) in the later stages of WW2, I feel the majority of the 1943/44 scenarios are still based on progress instead of merily holding on. I have the same feeling now playing as the Russians, at the Battle of Kursk, July 14th, 1943. Whereas the Germans should be on the offensive - I await... just about nothing happens. Representing the Russians, I am only attacked when gaining ground / going forward. I am to destroy 28 German armoured vehicles for a Victory - but instead of Germans assaulting (my) Russian positions, I am again battling an offensive strategy instead of a defensive one - with perhaps in the last 3 or 4 turns some room for a counterattack. Not sure if others experience the same - merely sharing mine . Will this be the same in PC2? Just found another Tiger vs. Sherman video, maybe some will find it interesting (and maybe it's a good summary of the discussion as well)! So you're suggesting that the Soviets paid thousands of American and British tank crews to say the tank was essentially an under-armored, under powered death trap because...well...it was? Read with understanding, I'm not saying that they didn't complain because they complained (it's obvious). And exactly what does any of that have to do with the fact that the Sherman wasn't a very good tank and was mass produced more for it's logistical benefit than fighting ability? It isn't possible to create truly defensive scenarios in PzC, because the AI is hopeless incapable of mounting any offense. The best the designers can do is "defense at first, offense later" scenarios. Think about it- when on offense the AI takes forever to get its artillery into firing position, it often sends faster trucks ahead of heavier tanks, it often fails to engage when making progress involves taking loses, etc. If all you had to do was hold on, the scenario would be very boring. You'd set up some proper defenses, slowly retreat as required, and that's about it. I agree, the AI is only capable of some kind of (scripted) offensives when it has good visibility and more or less endless troops (e.g. compare Allied/Soviet offensives in McGuba’s Battlefield Europe). I wonder if the developers could provide their perspectives on this please, i.e. whether the AI has been improved to actually manage something like this? A serious question. Do you think that there is no propaganda in the USA and generally in the West? Do you claim that there is absolute freedom of speech, and media (especially mainstream) are honest, transparent and not influenced by current state affairs and their agenda? Do you think that CNN and BBC are (mostly) honest, and RT or CCTV are propaganda by definition? Do you think that Western politicians work for the best of their peoples and Eastern leaders are by definition autocrats at best, dictators in most cases, working only to make themselves rich, corrupt to the bone? Just FYI... lots of choice! Your post consists of what we call "what-about-ism". While defending an indefensible position, the natural tactic is to say "What about..." and then point out some completely unrelated flaw in your opponent. The idea being that once you can show that your opponent is imperfect you can then set up all imperfect systems as morally equivalent to each other. Of course this reasoning is complete and total hogwash. Not all imperfect systems are morally equal- some are far, far better than others. While propaganda and limits on freedom exist in established democracies, they are in no way comparable to the state controlled media of totalitarian regimes. Bringing it back to WW2, the suffering that the dictatorships, principally Germany, the USSR, and Japan, inflicted on their own citizens and those they conquered isn't even remotely comparable to the ethical shortcomings of western democracies. Not even close. Proline and Kondi, if cherry picking sources is something that works for you to hold your ground, good for you. Your beloved USA had apartheid until 60s, but it was a reliable democracy. It bombs and attacks dozens of countries in the name of it, but it's a democracy and has lower and insignificant levels of propaganda (compared to the bad bad East). Kind of weird, right, since everybody believed it until recently? Good to know. Just be aware that it's changing, and less and less people buy those fairytales and western propaganda (which ha(s)d a budget x100 compared to eastern one) is being exposed too, as the time goes. As for indefensible position, which one is it - that Sherman is maybe NOT the best tank in WW2? Are you both serious? I didn't even state my "favourite" tank (I don't have one) - my argument is that Kondi is full of wrong with mixing context, environment and half a dozen other variables to make Sherman superior. I already stated my arguments multiple times - yours are "totalitarian propaganda" and they lie because "dictatorship"? Check the mirror bro. I ended my observation with a question if this would be the same in PC2 - perhaps AI scripting has become a little more grown up and capable of doing more than just following a basic strategy - much in line with some of the realtime strategy games. "Only holding on" is not boring at all, think about the late 1945 scenarios, Berlin for instance - fending off wave after wave until the very last turn is for me far more challenging and takes a lot of creativity to withstand, than destroying an enemy with 3 or 4 turns left, and then plunging into a forever empty backland and try to conquer some cities in the distance that have no defense. Holding on can be far more rewarding when you can sigh with relief you're still alive at then end turn - for me that is... . Yes, it is boring. Think about the 1944 scenarios such as Mogilev where you can hold the bridges north and south of the town indefinitely using 2 units each. Or Kiev, where you can defend one of the bridges the entire scenario using one tank destroyer that never attacks (and never gets attacked because AI tanks don't attack AT). While it might not be boring if the AI were clever, it isn't, and it won't be. Berlin for instance - fending off wave after wave until the very last turn is for me far more challenging and takes a lot of creativity to withstand, than destroying an enemy with 3 or 4 turns left, and then plunging into a forever empty backland and try to conquer some cities in the distance that have no defense. Holding on can be far more rewarding when you can sigh with relief you're still alive at then end turn - for me that is... .
Berlin isn't all that exciting to me. You form your units in a defensive ball. The AI surrounds you completely, but it doesn't matter. The AI never organizes any kind of dangerous attack, and you pick off a couple units each turn, for like 20 turns. Then eventually the AI has nothing so you race across an empty map in all directions. The end. Provided you know how to set up a defensive formation you will do fine. There's not a lot of tension. I guess this comes down to AI scripting as well and a challenge for present PC2 developers ... Despite being a game with all its drawbacks, we wish to encounter better AI performance, as is requested by numerous PC gamers elsewhere. Im not into multiplayer games for practical reasons so Im only playing against AI which is sometimes predictable, but for me its a battle against AI merely, personally. Yes, interested in the screenshot.. . I can't speak for the strength or weaknesses of new Panzer Corps 2 AI yet, but I know how I'd like to proceed. I understand why people also want smarter and more challenging AI, but I have to be devil's advocate here and say that isn't really conductive to long campaigns, especially not Grand Campaign long. If you play chess and trade down pieces the entire game and win with 3 pieces left against 1 enemy... that's a great and hard fought battle of attrition but imagine playing the next round of chess with only those 3 pieces left. If every battle ends up being a Pyrrhic victory in Panzer Corps 2 where more than 50% of your CORE is destroyed by a smart and powerful AI... Your campaign is going to implode very quickly under that strain. In fact many players always bemoan the loss of their precious CORE units to the point of save/loading and requesting features like reforming units because they hate to lose even a few units. I don't think these players will appreciate losing huge chunks of their CORE over and over. Think about it, if it takes several scenarios worth of action to earn 5 stars of experience and a roster of heroes and medals... but you lose so many units at such rapid pace, it becomes a really big problem of trying to maintain any semblance of an elite fighting force. You'll be lucky if a fraction of your CORE is elite while the rest are fodder that need to be constantly replaced because the AI is so ruthless and savaging of your units. In fact that's very much how the highest difficulties of Panzer Corps play out. 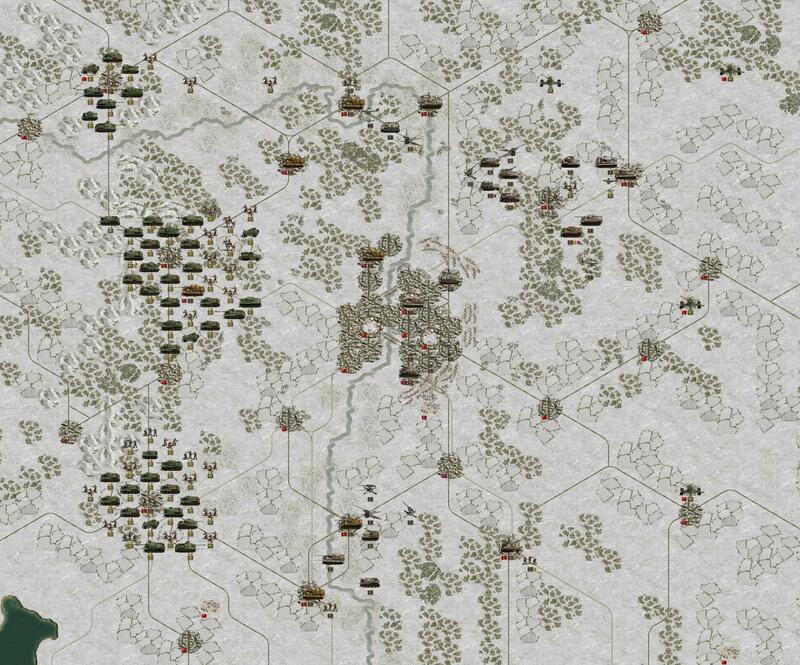 The only way I can survive Grand Campaign on Manstein +50% enemy unit strength is by adopting those tactics. It's too much of a prestige drain to maintain an entire CORE of elite units, you must choose only a few specific units to shower with elite replacements (tanks, arty, fighters), while the rest have to generally made do with cheap regular replacements or just being repurchased after death (infantry, AT, recon). That said, I have at least a few ideas up my sleeves I want to try when approaching Panzer Corps 2 content because it would add nice variety to the scenarios to have some where the AI is brutally strong not because of overwhelming numbers but through some other means... But we'll just have to see when we get there.